I have been meaning to get down to Locanda Verde to try some of their baked goods (ok, so it took nearly a year, I’m slow). The restaurant itself as well as the bakery has received raves from all over the place. Sometimes this can lead to a let down but not in this case. 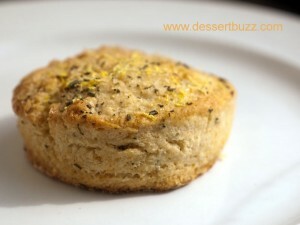 Both the lemon rosemary scone and the nutella cookie were first rate. And for a scone bought at 1:30 p.m. to still be really good after sitting around for half a day means that if I had tried it at 8:00 a.m. it would have been totally off-the-hook. You could taste both the rosemary and the lemon but what makes this scone so good is the texture, like a slightly less buttery biscuit. 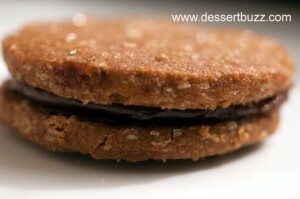 The nutella cookie reminded me of the Bouchon Nutter butter in that the filling is even better that you can imagine. 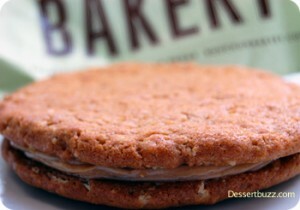 The cookies surrounding the filling are crumbly, textured and delicious. The woman in charge of Locanda Verde’s bakery counter is Karen DeMasco from Craft. She is also the pastry chef. Grub Street had a cool chart of what was on the marble bakery counter last June. Locanda hasn’t been open a year. They opened in May of 2009. Right, if felt like a year tho given that I wanted to get down there since last May. @cettedrucks They’ll need more eco-friendly containers for their second act. Where is all the new content?